I hope your guys got to see the halftime presentation during the basketball game today. The SoCon championship trophy was presented to Coach Ayers and the players. Coach Ayers made a short speech in which he said he knew a lot of the supporters were disappointed that many of the games were close. 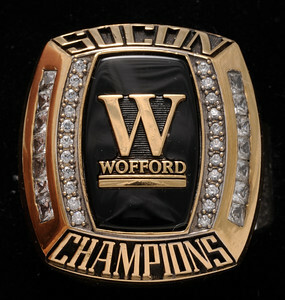 He said that Wofford was just a nice place and didn't want to run up the score on anyone! What kind of scenario would have to unfold to give us two home games at Gibbs? Anyone know? fgs44 wrote: What kind of scenario would have to unfold to give us two home games at Gibbs? Anyone know? A top 8 seed gets us one home game. If we win and and the seeded team we're paired with loses, we get a second home game. Sounds encouraging. But no chance of a cool Thanksgiving trip to like, say, Montana? Would like to see a second round game between Sammy and Jacksonville State... Sammy would give them a run... Would like to see Sammy again at Gibbs if it were bracketed that way. Does anyone have a link to info on the playoff schedule and times? Does anyone know how a loss to USC on Saturday would impact us? Obviously USC is a pretty decent SEC team but do teams that lose like that normally get shuffled down a few places or can they remain stationary? It would be a shame to have our team's hard work undone based on the timing of a loss to an FBS opponent. It shouldn't change things for us. However, I think we all know that we can't predict what this committee will do. We should have a seed secured, but it's certainly not guaranteed. The Citadel lost pretty handily to UNC last year and didn't drop. The Div. 1 football playoff schedule will air on 11/19/2017 @ 11am on ESPNU......Go Terriers! With no one in the conference with less than two losses and a pretty good showing against SC there is a chance we move a tick up in the rankings. Time to get a break or two and move in the playoffs. Just checked the rankings and I don't think anyone ranked above us lost today. A&T is out of the playoffs, so likely we will be seeded #7. At leat three teams ranked below us hurt their chances today. Furman and Sammy probably both solidly in. Getting ready for the selection show. Of the two big experts in FCS, one has us a six seed and the other the 8th seed. They show both Samford and Furman in the playoffs with Western among the last out. There is a little bit of argument over whether Jax St or NDSU should be second, but James Madison is the overwhelming #1. An 8th seed puts us in the bracket with JM. We have done the at Jax St and at NDSU things with limited success. RJ is the chair of the selection committee, but he explained that anyone on the committee whose team is being discussed either for a seed or in determining their bracket is removed from the room during that process. I know it is easy to say that it doesn't matter, and that you have to beat the best to be the best, but the truth is that seeding breaks make a BIG difference. There are some teams that are deadly at their own spot that you just want to avoid. For example, I think we have a much better chance against Jax St at their place than JMU at their place; and I think NDSU has a huge advantage playing in their barn. There are sufaces such as field turf and artificial grass that give the home team a real advantage. Oh, well, a little over a half hour to go. Intriguing match ups is Samford vs Kennesaw St. Potential stoney brook vs JMU. Last edited by WocoSix on Sun Nov 19, 2017 12:21 pm, edited 1 time in total.